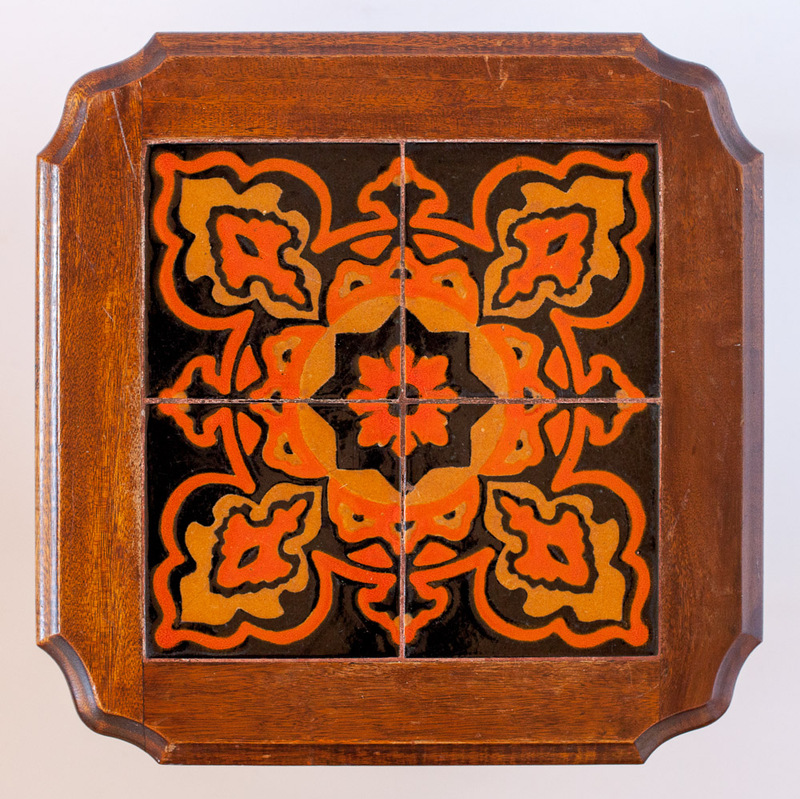 And another small table with a deco tile by Taylor Tilery (1930 - 1941). The Spanish geometric tile is larger than usual, so it displays nicely. 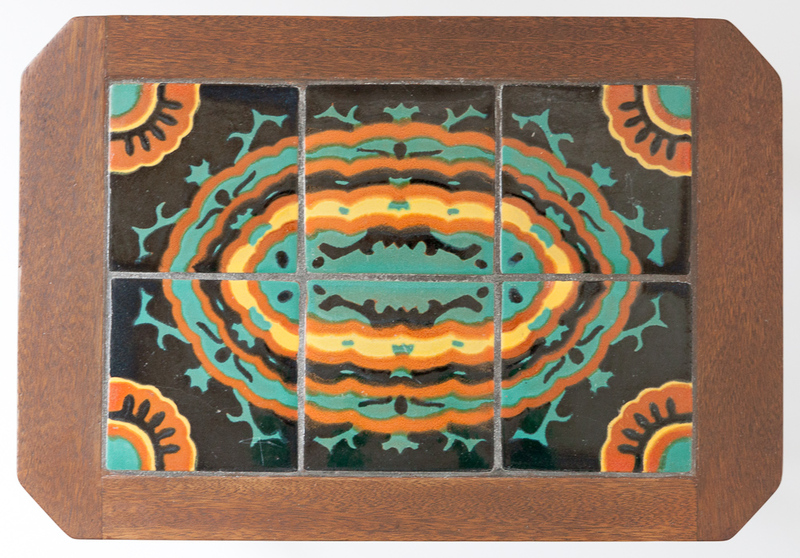 Two different versions of this design appear on page 157 of the California Tile, The Golden Era 1910-1940 (vol. 2). The design is listed in Taylor Tiles catalog as #82. Here we have a very simple small table by Taylor Tilery (1930 - 1941) with a single decorative tile and four triangular corner tiles. 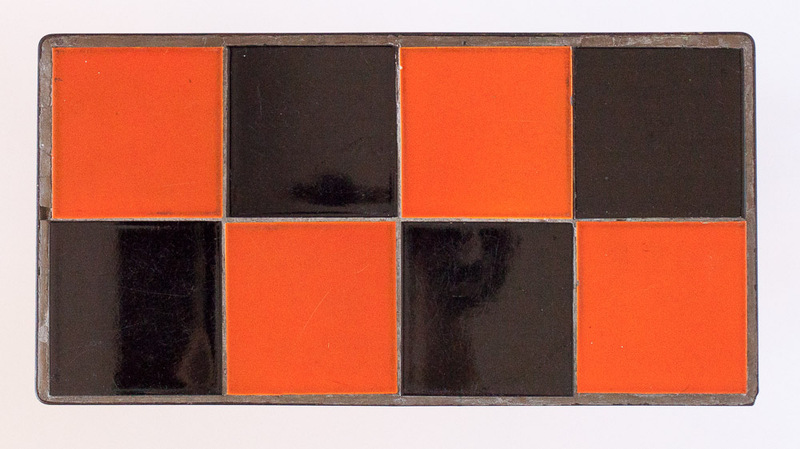 The glaze colors on the silk-screened deco tile are classic Taylor - black, orange, and light-beige. 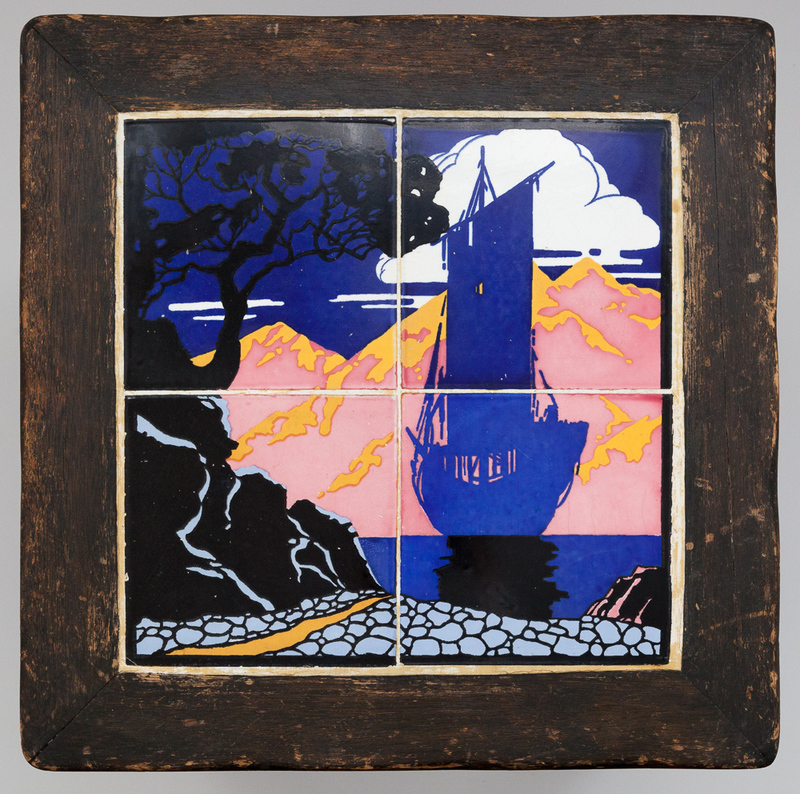 This design, with a different color combination, appears on page 160 of the California Tile, The Golden Era 1910-1940 (vol. 2). This sailboat table by Decorative Arts (1927-1933, Hawthorne, CA) is a beauty. I haven't come across too many Dec-Art tiles, and this table might just be the best one they ever made! The scene depicts a tall schooner in the bay, with a silhouette of a Monterey pine on the shore and pink mountains in the background. 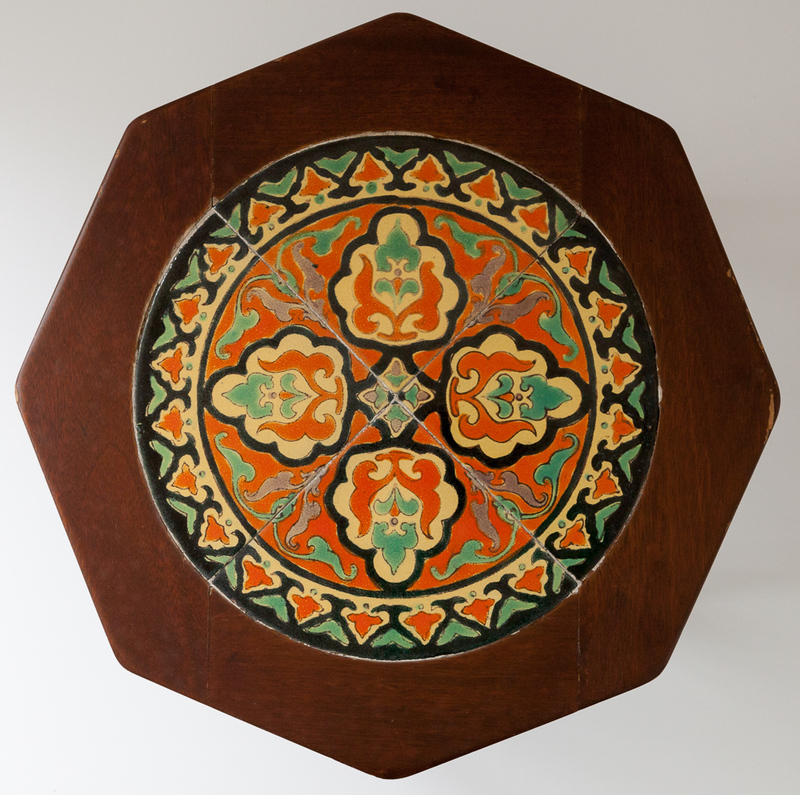 Octagon Table with a Roundel Tile Set by D. & M.
Comments Off on Octagon Table with a Roundel Tile Set by D. & M.
The tiles in this table are another example of Spanish-influenced designs produced by Taylor Tilery (1930 - 1941). 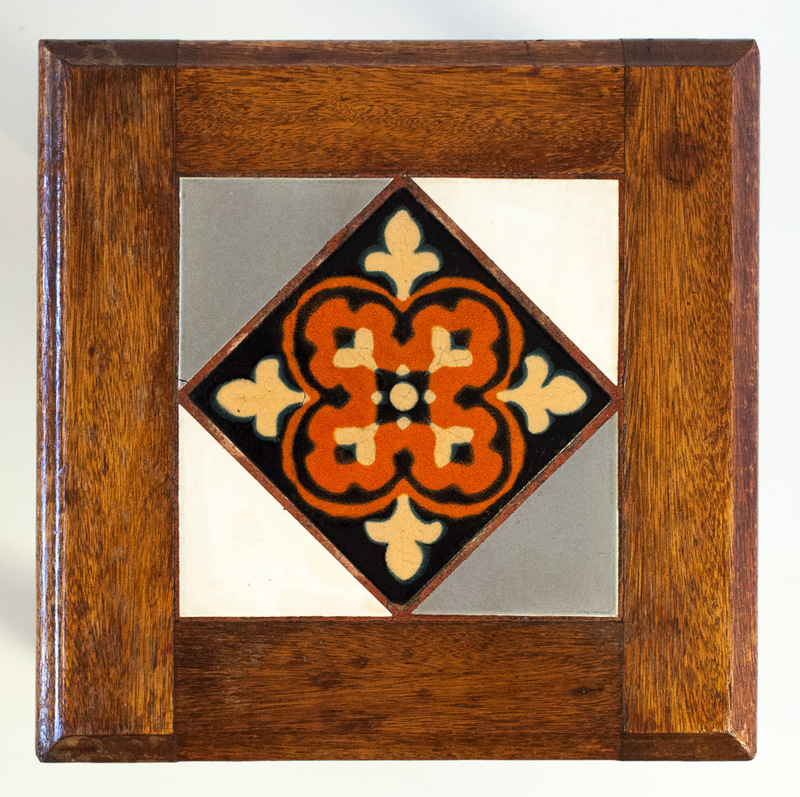 The festive geometric design is quite complex and uses a number of vivid glossy glazes in usual Taylor colors - black, orange, yellow, green, and beige. 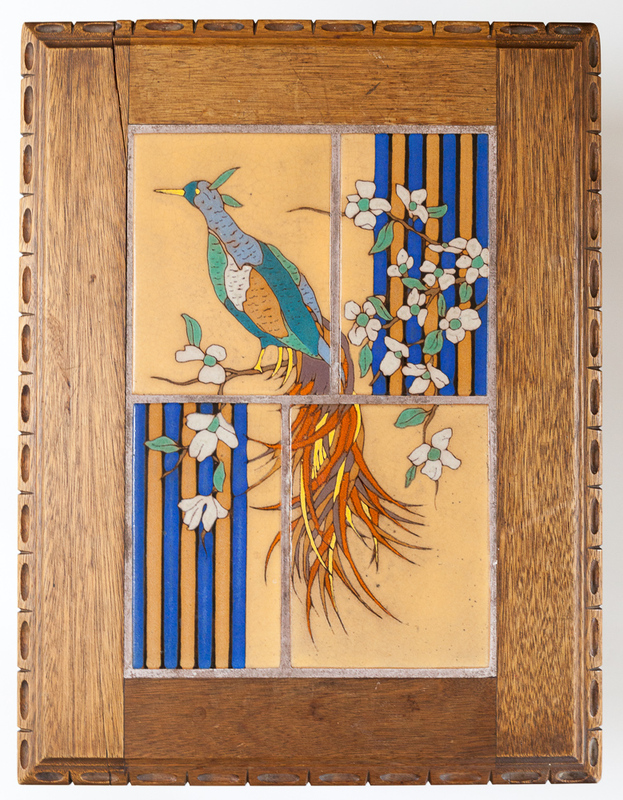 This design is shown on page 161 of the California Tile, The Golden Era 1910-1940 (vol. 2). 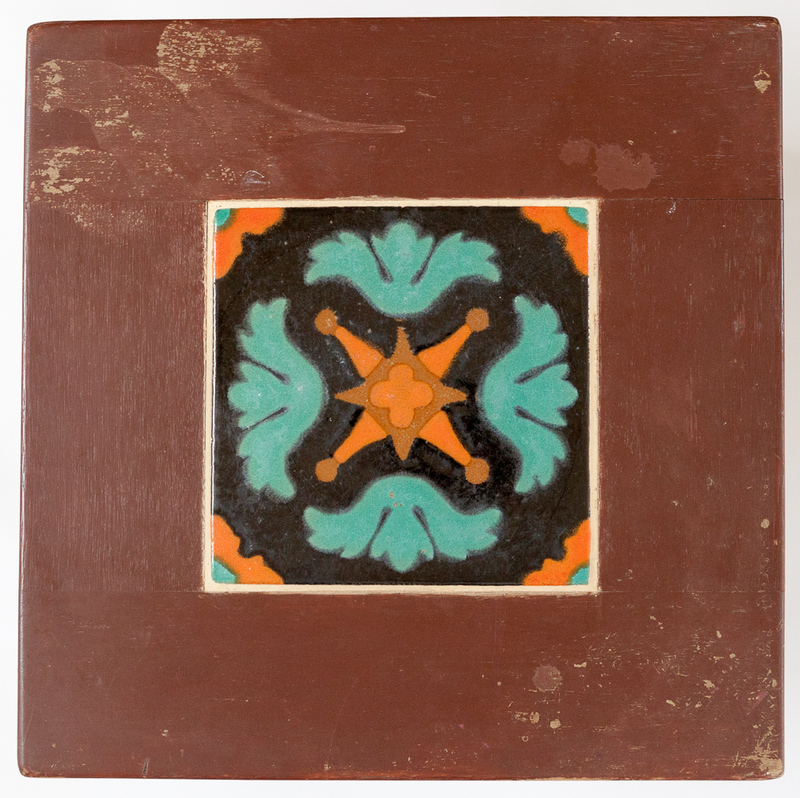 Another example with different glaze colors appears on page 265 of the Encyclopedia of American Art Tiles, Region 6. I could not find this design in Taylor catalog. This is my second phoenix bird (the first one is the linoleum wrought iron table), and I am quite fond of this one. Like many others in my collection it was created by Taylor Tilery (1930 - 1941), but it's a very rare and exceptionally well-executed design. Taylor had quite a number of different bird murals (jays, parrots, birds of paradise, pheasants), and this one is the best. 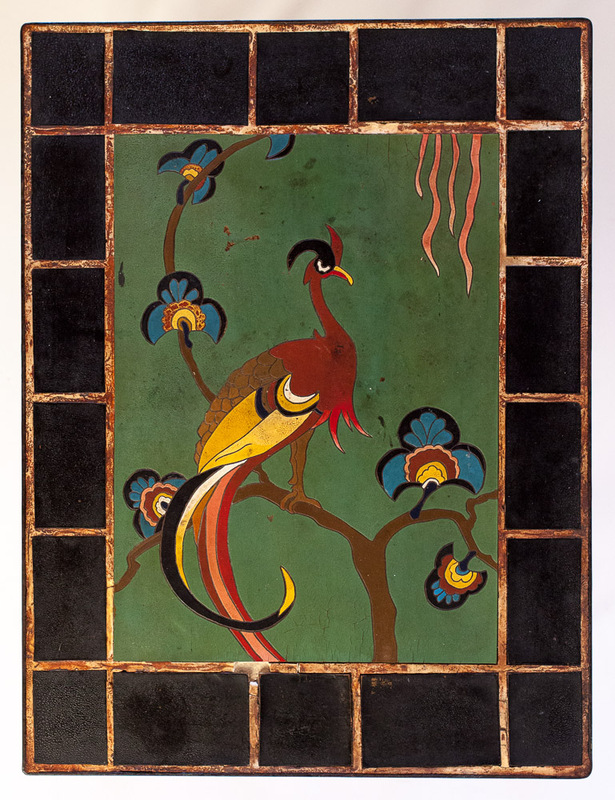 Four large cuerda seca tiles create an incredible Art Deco image of a phoenix (or a pheasant? or a bird of paradise?) perched on a flowering branch against a background of blue and orange stripes. Taylor used matte glazes for this mural; most other bird murals are executed in glossy glazes. It's bright and lively yet very tasteful. 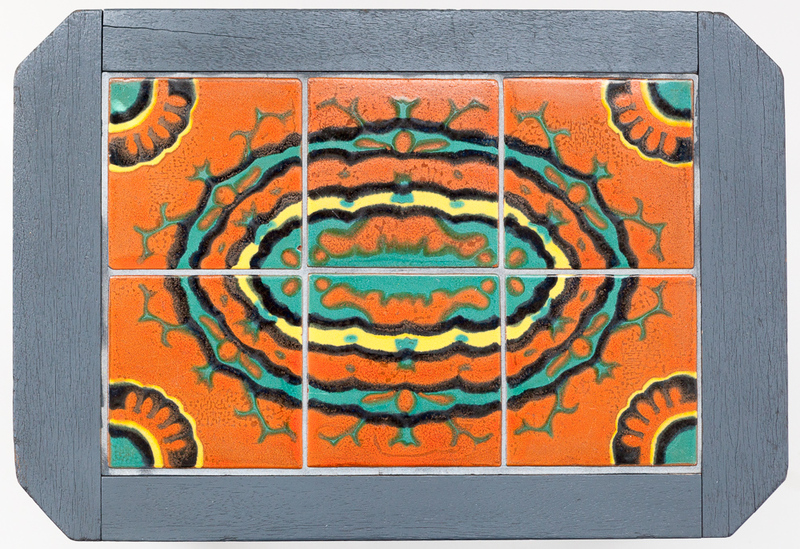 Tudor Potteries (1927 to 1939) tin-glazed tiles are often easy to recognize by their use of vivid, bright colors, especially orange and teal green. The patterns are usually pretty complex; intricate designs have definitive Spanish and Moorish influences. This might seem like a repeat post, but it's not. 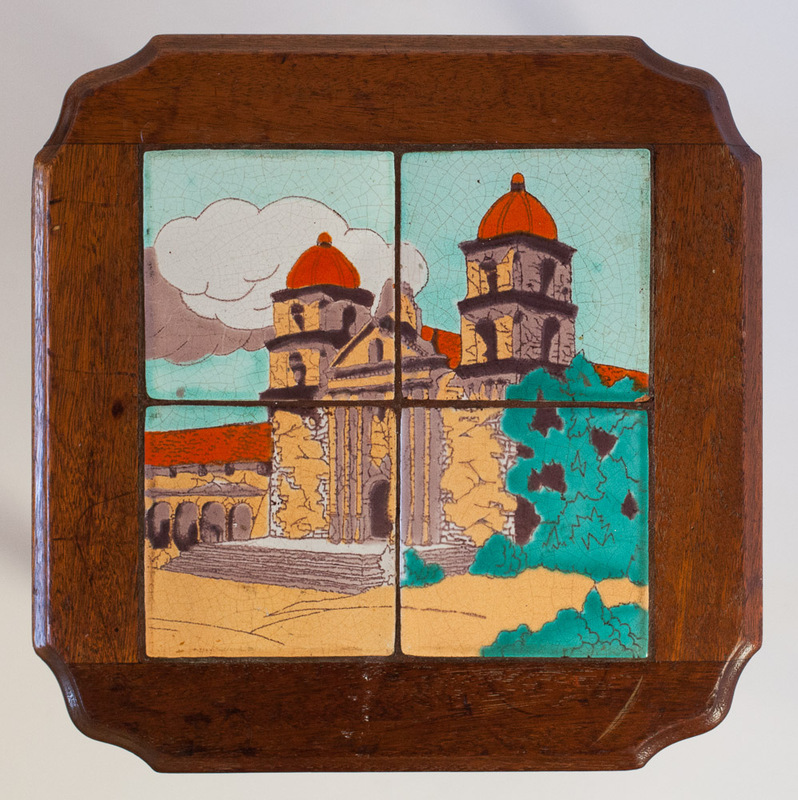 Taylor Tilery (1930 - 1941) made a number of different murals depicting Missions, and Santa Barbara Mission was featured more than once. This mural looks at the Mission from a different perspective, and the design is somewhat more dramatic, with more contrast. This tall stand is surprising. 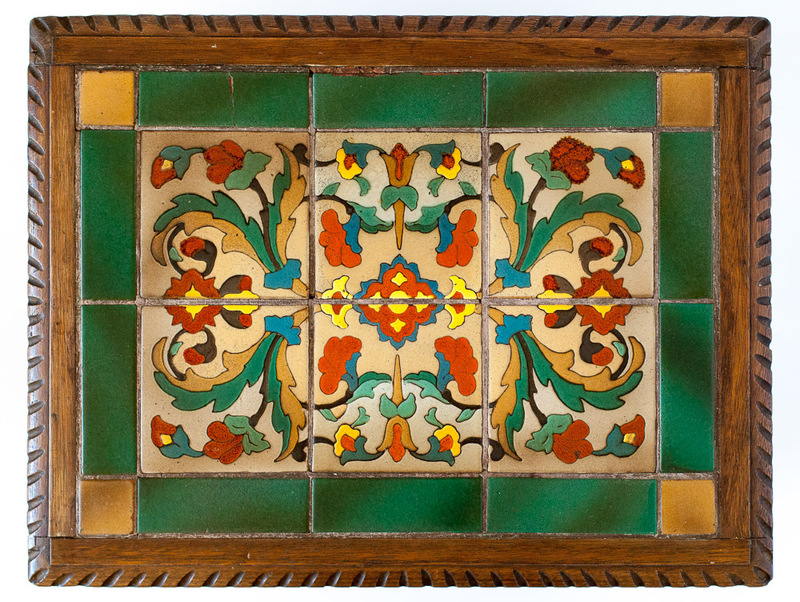 The tiles are undoubtedly made by Taylor Tilery (1930 - 1941), but I suspect that the stand itself - or, at least, the base - was made much later by a woodworker who had a set of vintage tiles lying around. I am stretching the limits of my collection here a bit: this is not a tile table. However, it looks like one, if you squint. 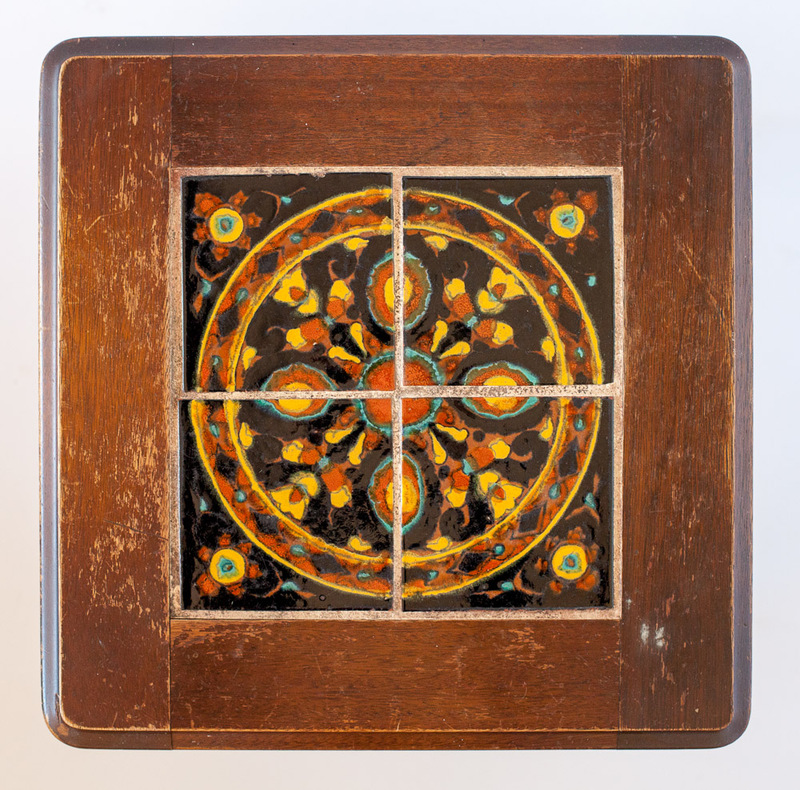 It was made around the same time that many of the tile tables were - 1920s - 1930s, and it has a wrought iron frame very similar to the ones that most makers would set their tiles into. It is "poor man's Catalina," in the words of the antique dealer I bought it from. Almost every tile company in the 1930s - Taylor, Tudor, Hispano-Moresque, D. & M. - had their version of the Racetrack design. They differed slightly in the choices of colors and texture of the glazes. 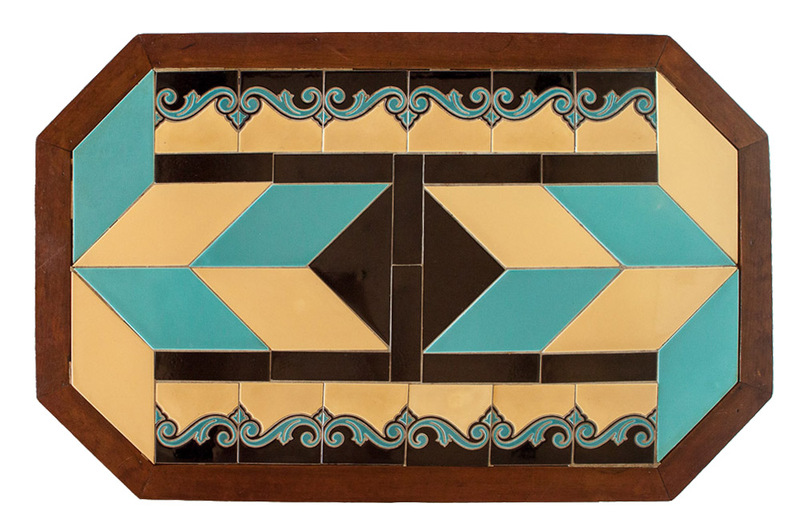 Caltiles.com has a great comparison of a few different versions of this shared design. 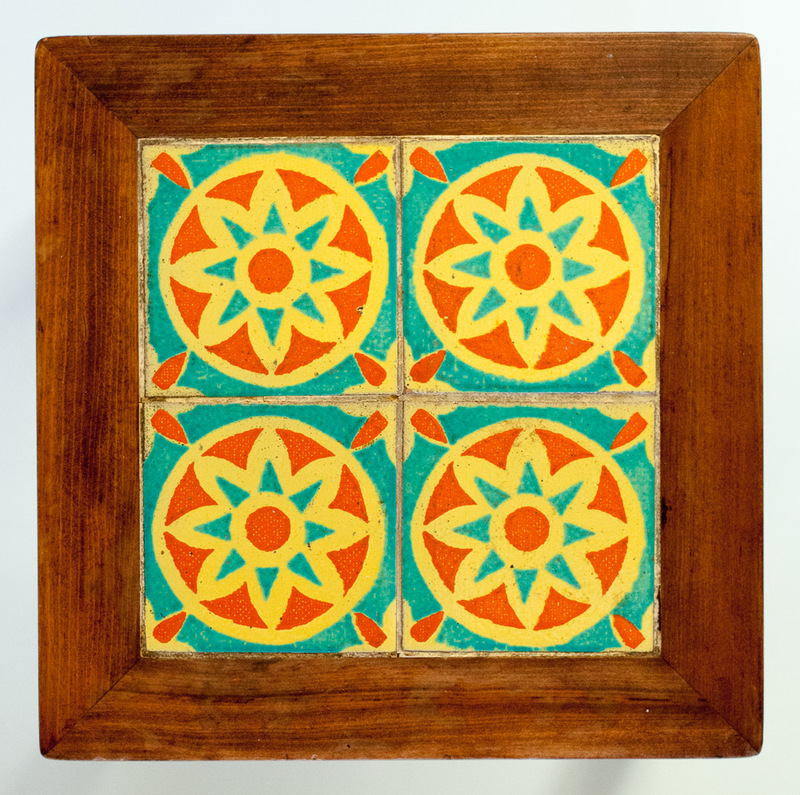 This four-tile design was created by Taylor Tilery (1930 - 1941). 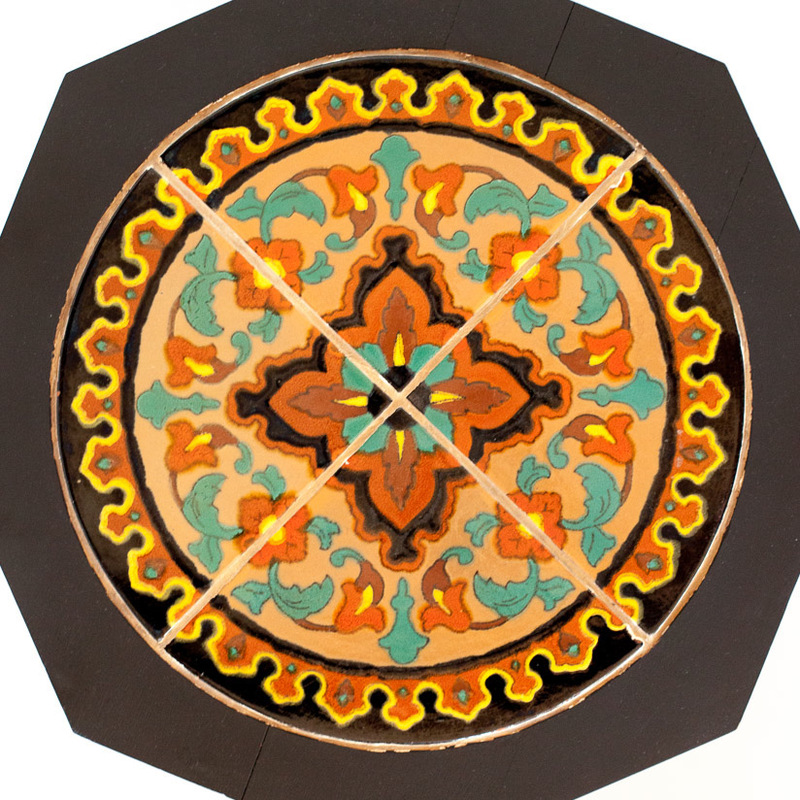 The Moorish tiles use only 3 glaze colors - black, orange, and mustard-yellow - yet they manage to create an appearance of a flame bursting out of the center of the table. Not much to say about this one. It's compact, and the bright, glossy red and black glazes really pop. I really like the wrought iron frame with the twisted stretcher bar; it's almost Gothic in style. 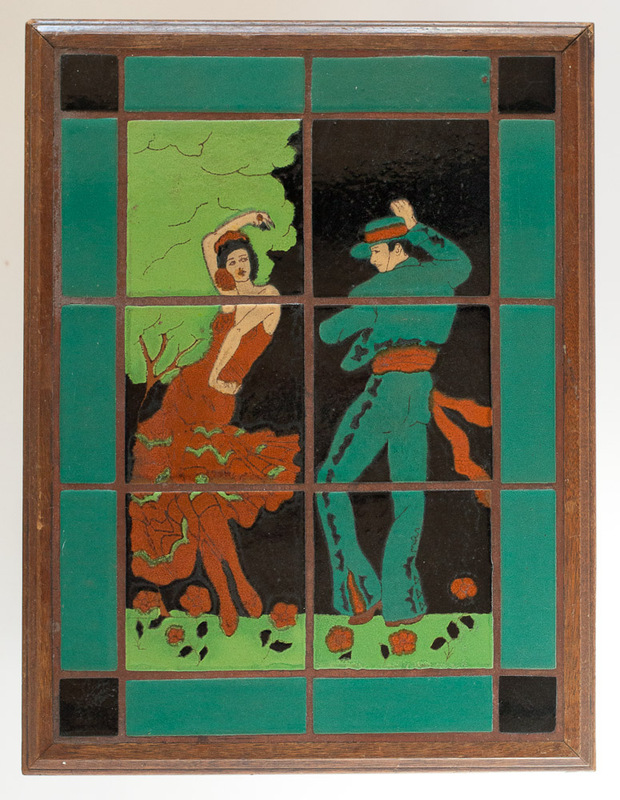 Taylor Tilery (1930 - 1941, also known as Santa Monica Brick Company) produced at least a dozen designs depicting Spanish and Mexican dancers. 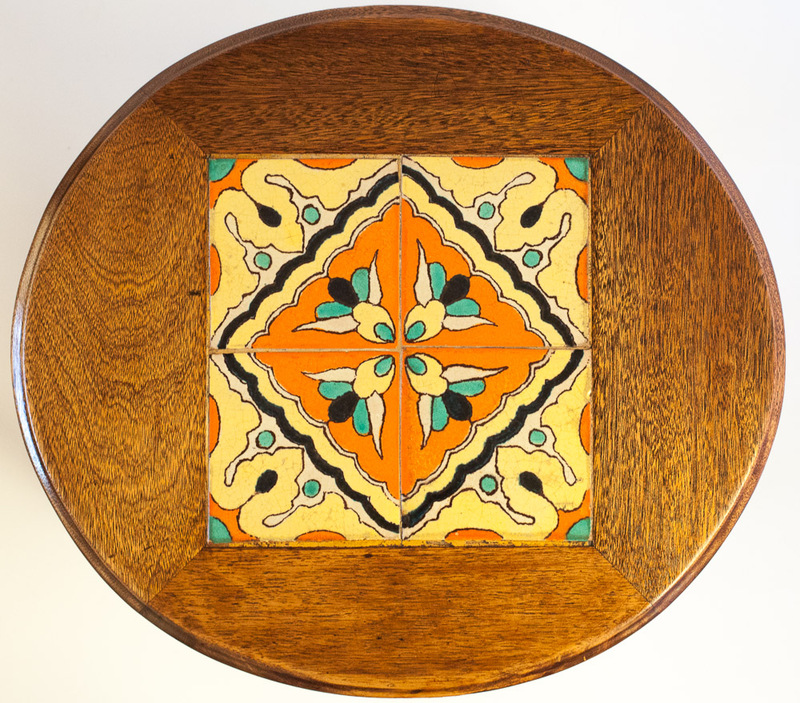 Tile tables were hugely popular in early 1930s, and Taylor was working closely with a few furniture makers in Los Angeles area. 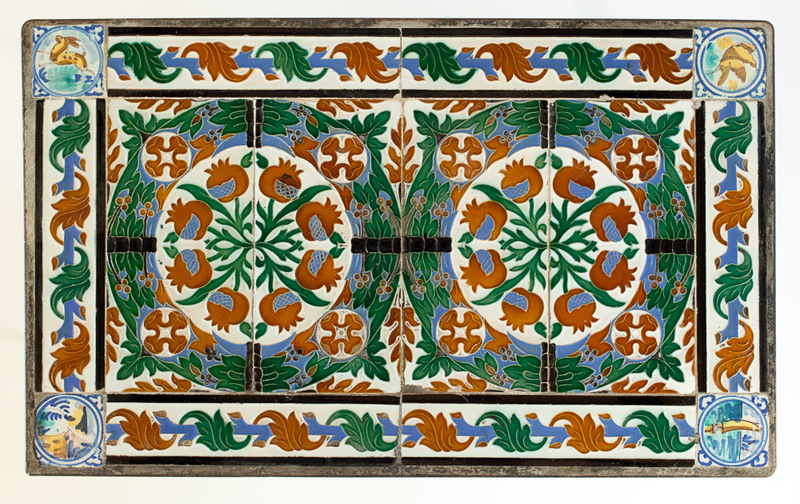 This table has a six-tile cuerda seca ("dry line") mural surrounded by green border tiles with contrasting black corners and set in a simple wooden frame. The tiles are fortunately in fantastic condition with what I think might be original terracotta grout. 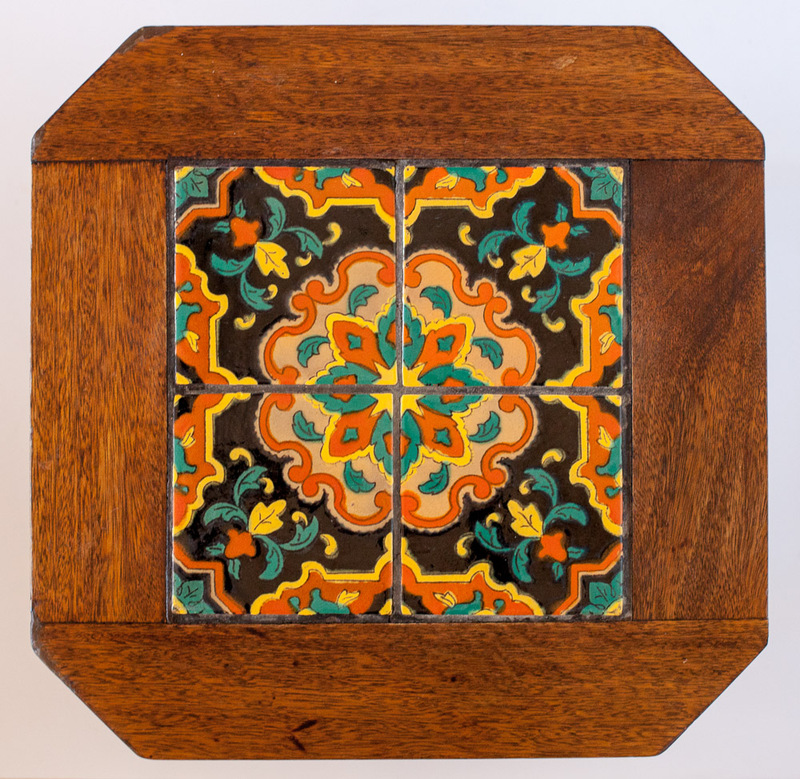 Curious Clay is my collection of vintage tiles, tile tables, and art pottery. Take a look at the visual guide, read the posts, and please get in touch if you are curious about anything you see here! I am actively looking for tiles marked Volga and any information about Volga Tile Studios or Nina de Volgenski.